Today i was eagerly anticipating meeting up with Mark and hopefully the fish were even more hungry than yesterday. Fortunately with some cloud cover it would keep alot of the people off the river. I went down to the river to meet Mark who had been there a bit earlier before me and after 5-10 minutes he waded upstream to me. After a catch up about the perils he'd endured, wading into deep water surrounded by 8 foot pools and a steep bank covered in hogweed, he'd practically crawled through the overgrowth and luckily only met his match with several bramble bushed, he had cuts and bruises to boot, fortunatly that section is on my radar for next spring. 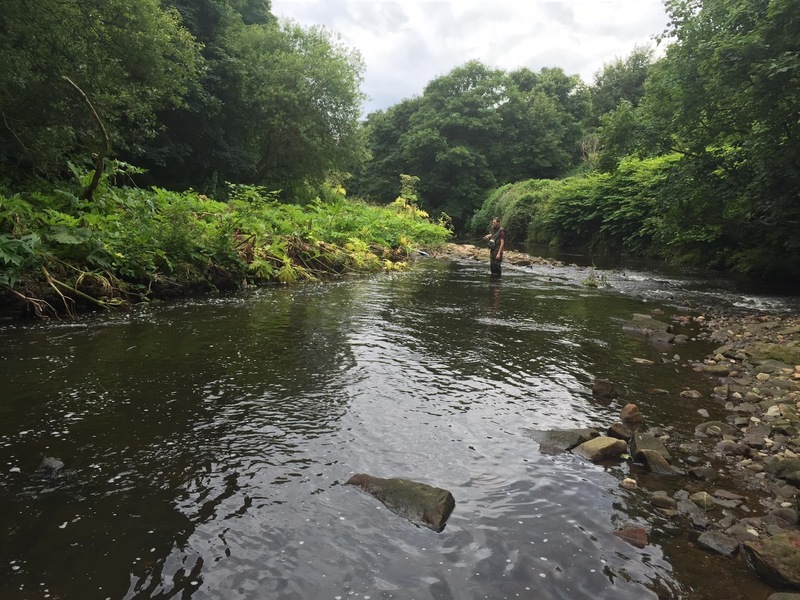 by the time i went down there to watch the water to see a fish rise every 5 seconds and to hear Marks fight with something big, the hogweed had already engulfed the bank and with very deep pools and a silty bottom the risk in getting there is too great. Next spring i will look at limiting the hogweed in certain areas especially the better runs. We showed each other our set ups to make sure we didn't match, to find what the fish were on earlier and worked our way upstream. With no hits in the riffles we did see fish rising up ahead but somehow despite how stealthy we are within 30 feet the rises stop. And they'll start once your 30 feet past them. Strange! 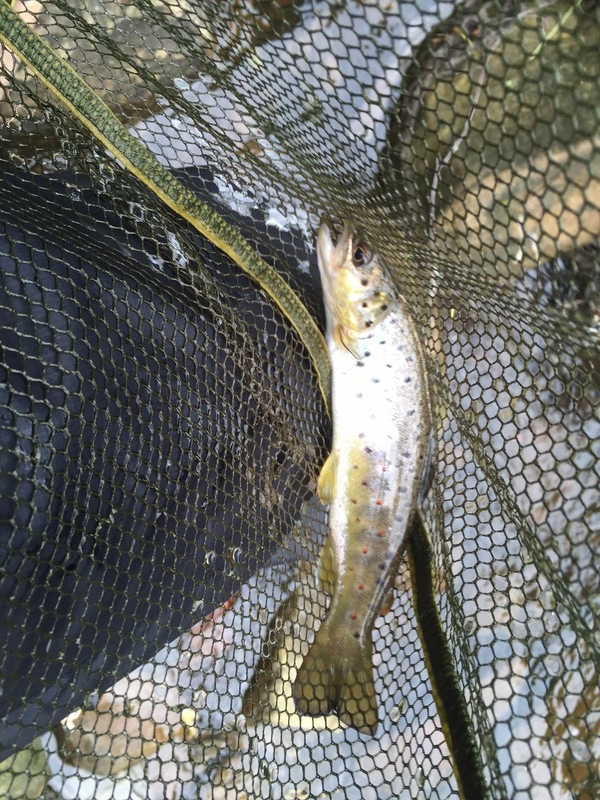 It wasn't until i was working an overcut that i saw my first trout. as i pulled the nymphs out to recast a trout chased them up to the surface then turned away. I tried a few casts but couldn't tempt it so let Mark know so he could have a pop but it still wasn't interested. Probably seen me as it rose up. A little further up i hit into a fish, i had no idea of its size as it swam straight at me, rod held straight up as i tried to keep the line taught, it jumped at my feet and came off. It was only a small trout but i was still a bit gutted. We headed a little bit upstream to a fork in the river, we allocated ourselves a side and worked our way up. First cast in the second section and i was in, it splashed around some but i let it have some water and managed to ease it into the net. 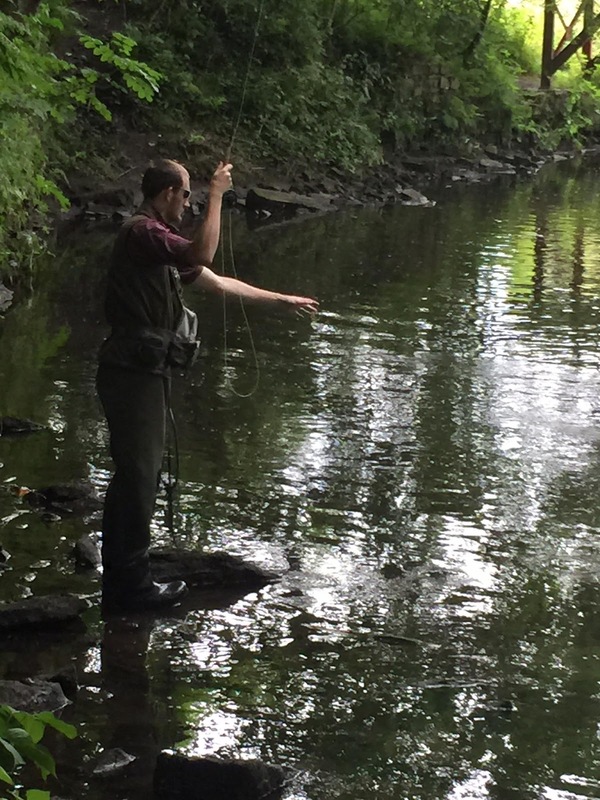 No sooner had i let the fish go i looked up to see Mark netting his own trout. We tried our hand at streamer fishing for 5-10 minutes, something we hadn't done before and still alot to learn. Trying to lure the fish out of deep slow pools with nothing rising is key on the agenda. But with nothing showing we headed upstream to a quieter spot which had 3 girls playing in the water. They soon cleared as we made our way down but again nothing was showing in the riffles. Up ahead though there was plenty rising so i tied on a klink and dink set up while Mark retained a shiny nymph. The fish stopped rising as they always do as we drew closer, after my 3rd or so cast down went my klinkhammer as something grabbed my nymph but i missed the strike, i had no other hits but plenty of tangles as i found it tricky in the enclosed space. Again the trout started rising behind us as we moved up so Mark allowed his line to run downstream. As his line drew taught and created drag his nymph would rise in the water like an emerger and sure enough a fish rose up after it with a slight leap before disappearing again. it had rejected it at the last second, and unfortunately it was the last of our action. A strange day as i had expected more after the previous days fishing and with better conditions and less people around but that is river fishing for you, totally unpredictable. Still a great day though!